When I was a fledgling change agent, I kept a little blue notebook hidden in my purse. 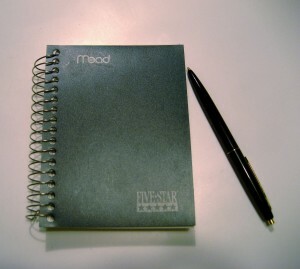 It was a Mead Five-Star Fat Lil’ Notebook. Inside were one-page observations, comments, quotes and complaints that reflected what I felt needed to be fixed at the company where I worked. It’s probably a good thing that blogs hadn’t been invented yet. Lack of follow through. We are good at identifying problems but frequently push them aside to focus on other things. Sometimes we even know the solution and don’t follow through. Sales managers are given a bonus based on accuracy of the total number of cases. The customer of the forecast is the planning department. Total number of cases does not help them plan better. Reward the desired behavior – some measure of SKU or category forecast accuracy. No one can say anything in front of [name]. He should not be the end of the line final decision maker. Does he know people are closed-mouthed around him? His decisions sometimes are reversed at meetings he doesn’t attend. What is our strategy? To sell to anyone who will buy? Why are we not more discriminating in what we sell? What is the process that makes us continue to try to sell every combination of goods? The notebook served a few purposes. A record – it’s easy to lose sight of things that need to be fixed when you either get used to them or move on to something else. Writing it down preserves the memory, and you can go back and count the number of instances something is mentioned to measure its importance (forecast accuracy was a big deal). An outlet – you can tell by the tone of some of the comments that I was mad or annoyed. Writing was a way to vent the negative emotion. It can also help clarify what is the crux of the problem. Granted, I was not able to fix everything on the list, but I was able to take a stab at some of it. And that’s really my point. Don’t keep a journal like this just to document the list of everything you don’t like about your company. Write with the best intentions to take action and improve the important things. Inquiry: What’s in your little blue notebook? What are you going to do about it?